This week the TWD crowd will be going in about 200 different directions (and I’m not just talking about holiday travel plans)– we’re having a “rewind” day to make up a missed recipe or remake a favorite. I’ve been in the group for a long time, and I think I can count on one hand the number of recipes I’ve skipped. At some point, I’d like to tick at least a few of those of the list, but not this week…this week, I’m revisiting a recipe I’ve been itching to try again. Back in September I made a Summery Peach Upside-Downer, and I’m been thinking about trying the original Cranberry Upside-Downer version ever since. Now’s the time, especially since I’m on a cranberry roll this month! The cake was just as soft and cinnamony as I remembered from the first time. 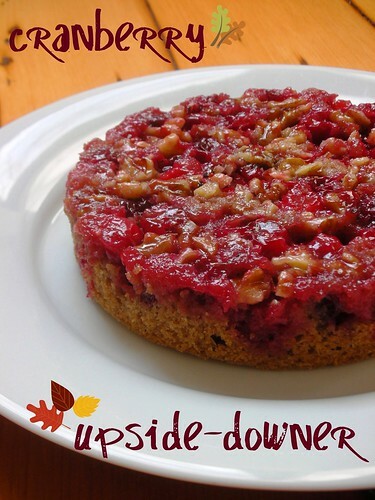 I think I actually prefer this version, though, because the tart cranberries are a perfect balance for the sticky sweetness of the butter-sugar topping. If my husband weren’t insisting on pie for Thanksgiving, I would certainly not hesitate to put this on the table on Thursday night! For the recipe, see Baking: From My Home to Yours by Dorie Greenspan, or read Superfluous, as it was Sabrina’s choice a couple months ago. Don’t forget to check out the TWD Blogroll to see what everyone chose to make this week! Happy US Thanksgiving!! Lovely choice – I enjoyed this cake, and as we are coming into summer, your peach version sounds like a good reason to re-make it. Im glad you enjoyed this recipe! It sure looks good and is a perfect fall treat! I loved this cake so much that I made it twice when Sabrina chose it! Not with cranberries, but I am seeing so many of them that I just might have to give them another chance. Your cake looks gorgeous. Now this is one I would make again. Your photo is beautiful and makes me relive the cake. Nicely done! Oh, yes, thank you for the reminder as I had to make it sans cranberries the first time and made a note to revisit this one for Thanksgiving, not sure I would have remembered without this photo of yours…gorgeous, just gorgeous. Happy Thanksgiving! This was a good one wasn’t it. And it was beautifully tart and sweet. Your cake looks awesome Steph! Hope you and your family have a Happy and Safe Thanksgiving. That is so lovely! Love the red from the cranberries!